Home » NEWS » Rebels with a Cause! An outlaw is Defined as a person Who refuses to be governed by the established rules or practices of any group. 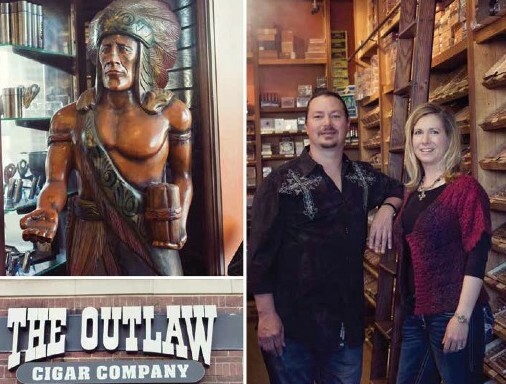 One conversation with Kendall Culbertson and his wife, Leecil, is enough to understand how that word wound its way into the name of their hugely successful business, The Outlaw Cigar Company. Despite its cult status among cigar aficionados and its destination-vacation-esque appeal, the business thrives not only because of edgy marketing and stellar product, but because the Culbertsons make each decision based on one simple formula; namely, each decision must be the best decision for their family and there must be an underlying passion. The couple insists on both elements. Together for 13 years, Kendall and Leecil met online before online dating was commonplace. Kendall says he knew immediately when he met her that Leecil was ‘the one’, though he also admits that the attraction wasn’t as instantaneous for Leecil. A transplanted Johnson County resident, Leecil joined Kendall in the Northland where they each worked at lucrative and typically upward mobile jobs before having children. Kendall owned Midwest Technology Connection, a prominent IT company, while Leecil was successful in sales. Their lives changed, though, when they learned Leecil was pregnant. “We decided to sell the computer business, and to slow down. I’d seen people all my life, working crazy hours, chasing deals and making decisions based on money,” says Kendall. “We became parents when we were a little bit older, and there’s a wisdom that comes with that. My first priority was to be a dad, and to always put my family above financial success. You can chase money,” he says, “or you can chase life. We choose the latter.” Known as the most famous cigar store in the country, The Outlaw Cigar Company boasts the largest inventory and most dynamic calendar of events in the industry. Kendall credits the passion that his client base has for not only cigars, but for the cigar lifestyle, for the company’s success. “Think about it,” he says. “Where does a guy in his for- ties go to connect with other guys? It used to be the barbershop, but that’s a thing of the past. Bars these days are for kids, not for family guys. There just wasn’t anywhere for guys to go to enjoy the things that guys like.” So he built that place. “Women come too, and say ‘Wow! This is really cool’ because we’ve created the ultimate grown-up man cave. We have all the things that men love: cars, girls, golf, guns, sports and more. Our events bring all of that to a place that is comfortable and cool, and because of that, we are able to get many cigar celebrities to sponsor events here when they won’t go anywhere else. Our reputation in the industry, which is an extension of our philosophy and our passion, sets us apart from any- one else,” says Kendall. The couple makes a good business team as well, with Leecil playing manager to Kendall’s big picture think- ing. She makes the business work, sees that bookkeeping is done and personnel are hired while Kendall stays out of the daily logistics and instead focuses on keeping the momentum of new and innovative plans flowing. A new line of blended tobaccos and a potential reality television show are just two of those innovative and exciting offshoots of their family business. Blending tobaccos is a labor of love for Kendall, and he travels frequently to Nicaragua, Honduras and the Dominican Republic in order to do so. He first took interest in blending more than three years ago and is self-taught. His growing passion for tobacco gives him entry into environments that typically wouldn’t be friendly to outsiders. While his efforts in blending have created additional business opportunities, his intent was not tied to any particular outcome; he was simply fascinated with the different types of tobacco and the nuances of each. His passion for the process and the resulting product drove him to continue his education and experimenta- tion without any promise of success. Still, success found him and exclusive product lines and national mail order house partner- ships transformed his passion to smart business sense. They hope the same might be true of a potential reality show. “We were approached by a company based in Los Angeles,” says Kendall, “about being the subject of a reality show. They were looking for a unique cigar store, so we interviewed over the phone and they flew in to shoot the pilot. They are currently pitching that pilot to major networks, and there’s a very real chance that it will go through. Kendall points to his stores as proof that, on paper, his decisions don’t stem from financial motivation. “You can see it the minute you walk into our Overland Park store,” he says. “There’s over 5,000 square feet of just hang out space. No products, no alcohol, nothing but a place for our customers to simply spend time. On paper, that’s a business plan that should never work, but because of the passion for what we do, and the passion of our patrons, it absolutely works. “No matter what the discussion is, our question always comes back to whether or not the outcome is what we want for our family. We might not be taking as many family vacations as we used to, but all of our time is family time, and that’s what matters to us,” he says. Still, there’s no shortage of proof that their strategy is working. Kendall was awarded the “Top 25 Under 25” Award from KC Small Business Magazine in 2009 and the company boasts a 2009 “Community Business of the Year” award from the Platte County Economic Development Council. The company sends more than $40,000.00 in cigars, annually, to troops overseas and incorporates an element of charity into each event held at the store. A native Northlander, Kendall was not only born and raised in the Northland but has never lived in a home outside a ten mile radius of his childhood residence. Long before the Northland developed and Barry Road brought additional shopping and dining options, Kendall loved his little part of the Metro for the people and the lack of traffic congestion. “I love the Northland because people here are genuine, friendly, helpful and no- ticeably different,” he says. Though the Culbertsons have opened a store in Overland Park, Kendall is quick to point out that it took a Northlander to show Johnson County ‘how it’s done’.